There’s a corpse among the chanterelles! Redwood Cove Bed and Breakfast manager Kelly Jackson is hosting a cooking class during the Week of the Mushroom festival to attract guests, not drama. But soon after she finishes foraging for an edible mushroom species on sacred Native American land, a local newspaper reporter gets shot dead at the same site. With suspicions spreading like fungi in the quaint Northern Californian community over the culprit’s identity, Kelly and a savvy gang of sleuthing seniors known as the “Silver Sentinels” must uncover the truth about the secluded property before a tricky killer prepares another lethal surprise . . . 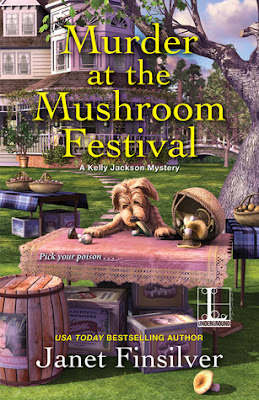 This book has Kelly Jackson whose all geared up to be hosting a cooking class on Mushrooms to go with the week of mushroom festival. Of course not is as it seems. Peter is determined that only humans hunt for mushrooms when the arrival of a dog and pig add to the mix the mood changes. Kelly also learns about Redwoods being impossible to take as there are laws about the removal of Redwood trees. With reporter Ned involved it's not long before someone winds up dead and it's up to the Silver Sentinels to determined who killed Ned the reporter and why? Was it someone who had a grudge against Ned? Or was it someone else he burned in a older article? So many possibilities the sentinels definitely have their work cut out for themselves. Will Kelly solve the murder in time or will she be capped as well? 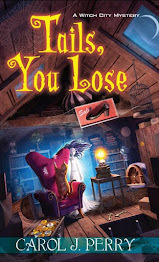 This book had everything from missing redwood trees to people conspiring over mushrooms and finds Kelly and the sentinels in the middle of it trying to figure out who committed the crimes. When pressure gets put on Daniel a Native American gets caught up in being a suspect Kelly is determined to find out what is going on and why. 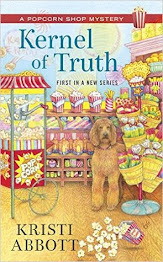 I love this series as one of it's characters has Asperger's syndrome which is rare to see. It's great to incorporate various things in a book. This one definitely has it with Native American's, Asperger's, and so much more I really enjoyed it!